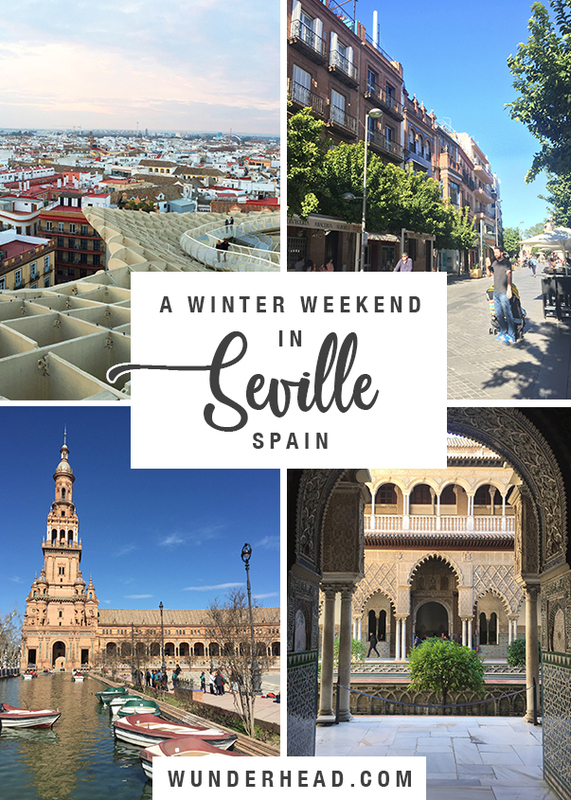 Beautiful Moorish architecture, blue skies, delicious food and very reasonable prices – we adored Seville, and think you will too. I thought about starting with tourist attractions, but let’s face it, the real star of the show is the food. Most cafes do a traditional breakfast combo of coffee, zumo de naranja (orange juice) and tostada (toasted bread with tomatoes, ham, cheese or all of the above) – even if you’re a strict cereal-lover, make sure you try this at least once while you’re there. Eat in the street for the real local experience. 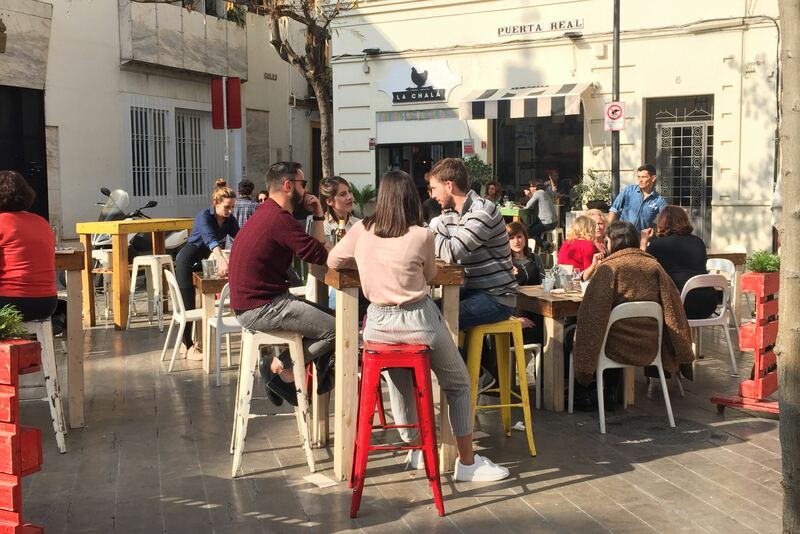 Tapas bars spill out onto streets and squares. Apart from breakfast we managed to have tapas at every single meal (a personal triumph). Every menu will feature papas bravas – you might know them as patatas bravas, potato wedges with rich tomato sauce and sour cream – and croquettes of some kind. If you’re worried about ordering too much, don’t be afraid to start small, you can always order more later. Do not even attempt to eat healthily, almost everything is breaded and fried, or at least covered in olive oil. Embrace it! 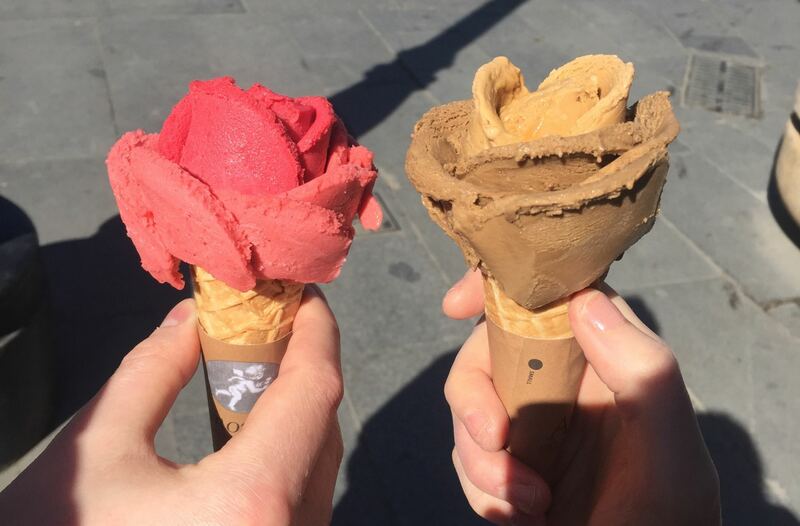 If you find yourselves in need of an afternoon pick-me-up, get to the nearest Gelateria and order yourselves some ice cream or a box of churros to dip in hot chocolate. Most restaurants are open for lunch from 2-4pm, and then reopen for dinner at 9pm. Many of them are closed on Mondays, so if you have somewhere in mind make sure you check ahead! You can’t really go wrong, the food everywhere is practically guaranteed to be wonderful. 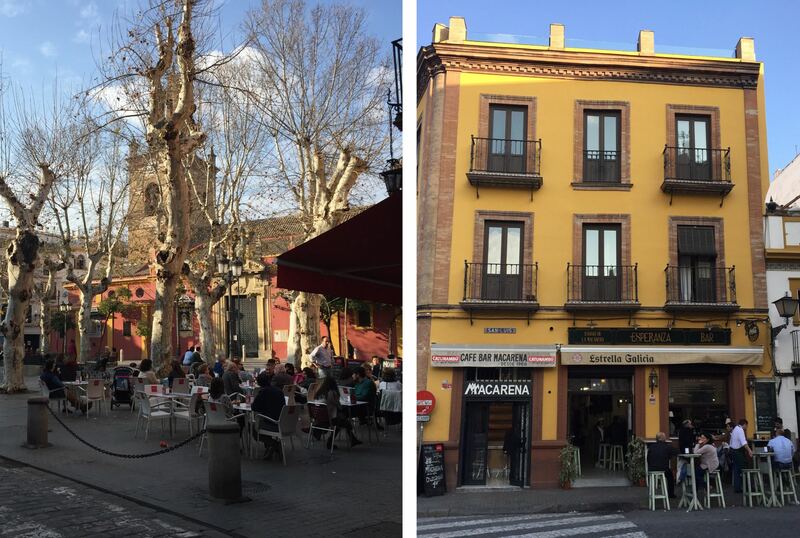 If you want to wander around and stumble across somewhere, try Calle Mateos Gago by the Cathedral – this street is bristling with restaurants and tapas bars. You can explore the Mercado de Triana for the freshest food in the city, but try to go early to get it at its busiest and most interesting. The Alameda de Hércules is a local favourite and a great location for discovering restaurants and bars, with the added treat of Ancient Roman columns at each end. La Chalá Tapas Bar in Plaza Puerta Real. Our personal favourite for lunch was La Chalá on Plaza Puerta Real, which we visited on our very first day. After being told no tables would be available for half an hour, we ordered drinks and hung around the edge of the square, basking in the sun, waiting for our turn. Well worth it! Who knew smoked aubergine drenched in lemon olive oil would be so damn tasty? Add cod croquettes, tuna tartare tortillas, fried veggie rice topped with bacon bits and what seemed like a deconstructed beef kebab and you’ve got the perfect welcome meal. 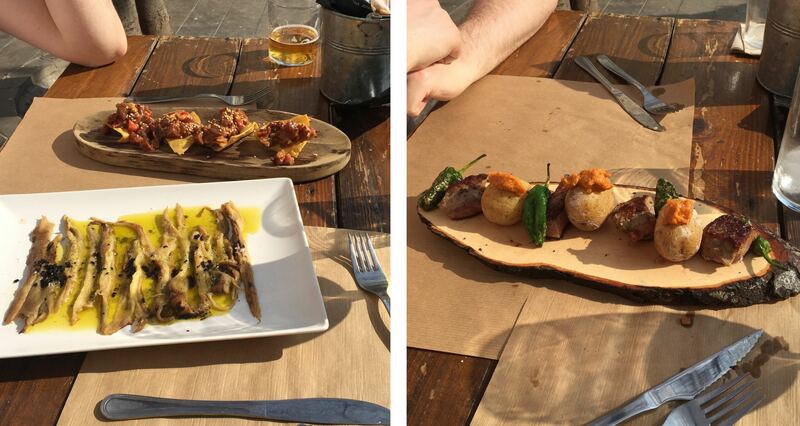 Delicious tapas on our first day in Seville. The real food highlight of the trip has to be La Brunilda, described to us by our airbnb host as “contemporary tapas”. We chose to ignore her advice to book ahead, fools that we are, and when we arrived at 9pm it was rammed – and remember this was a Tuesday night in February. I dare to think what the queues outside must be like during peak season. Luckily they managed to squeeze us in at the bar, which ended up being the best seats in the house, with prime views of the chefs at work in the kitchen, and easy access to our lovely waitress who even treated us to free aperitifs to round off the night. Rioja and roast pork at La Brunilda. The lesson? Don’t be put off by a busy restaurant or a long wait for a table – stick it out and reap the rewards! 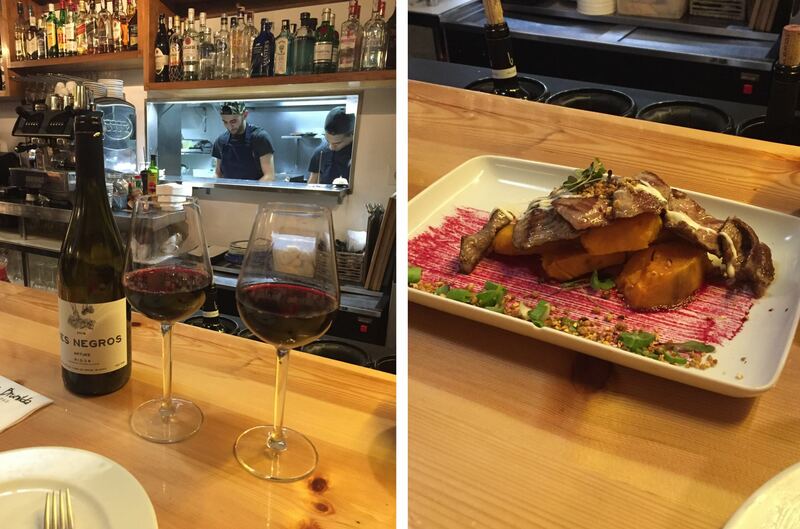 We also ate dinner at La Chunga, a cute little tapas bar with exceptional service and great wine, and at Maquila, famous locally for it’s craft beer. Matt chose both places, so he gets full credit for these finds. The view from this modern attraction (the largest wooden structure in the world by the way) is truly stunning, especially at sunset. When you emerge from the lift and climb up to the top you’ll see the whole city sprawled out in front of you, the pastel coloured buildings interrupted by tiled domes, elaborate towers and sparkling rooftop bars. The parasol itself almost feels like you’re walking over the tops of trees, and although the modern shape disrupts its environment, it still manages to feel as though it grew up between the buildings around it. This was the moment when I finally felt the excitement of being on holiday and discovering a new place. An adult ticket is €3, and you get a free drink in the cafe at the top! 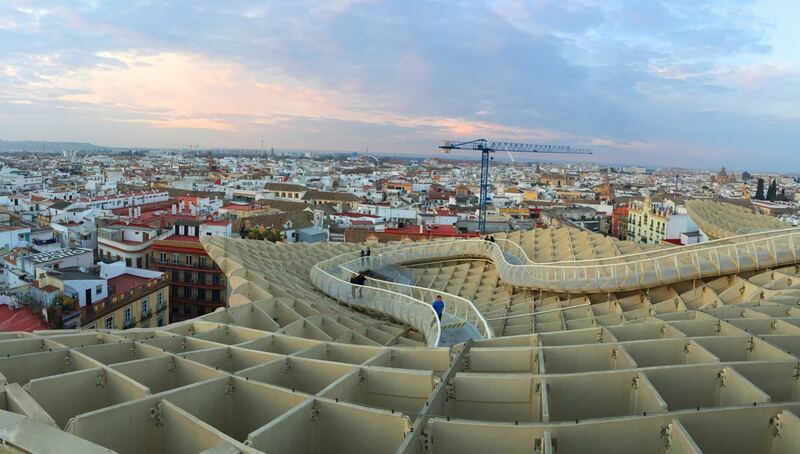 The Metropol Parasol at sunset. 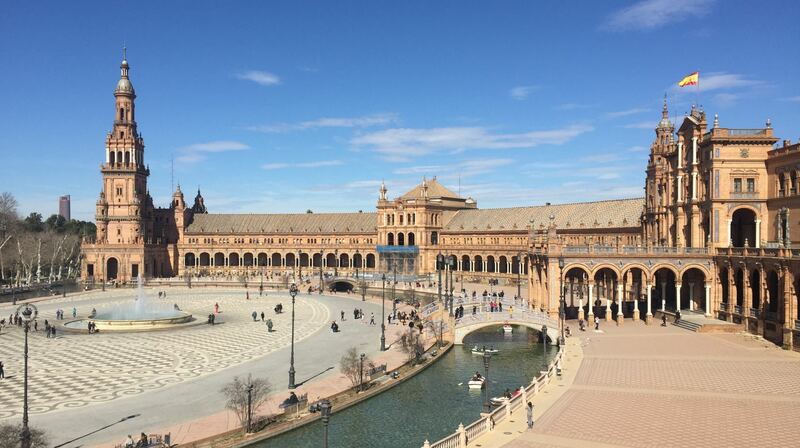 The unforgettable filming location for Naboo in Star Wars Episode 2: Attack of the Clones sits in the Parque de Maria Luisa, and its towering spires can be seen for miles. This elaborate Renaissance/Moorish structure might conjure up romantic images of Spanish kings of the past, but in reality it was built in 1928 for the Ibero-American Exposition of 1929. Basically the purpose was the impress the Americans, and you can bet it succeeded. This sprawling expanse of archways, fountains, tiled floors and ceramic accents is definitely impressive. You can even hire a gondola and paddle your way round the moat, although I have to admit this seems like more hard work than it’s worth, and collisions are highly likely. But don’t overlook the park itself! We found a beautiful pond hidden away, full of fish and framed with tiled walkways. Definitely worth the walk, plus, no charge to get in! 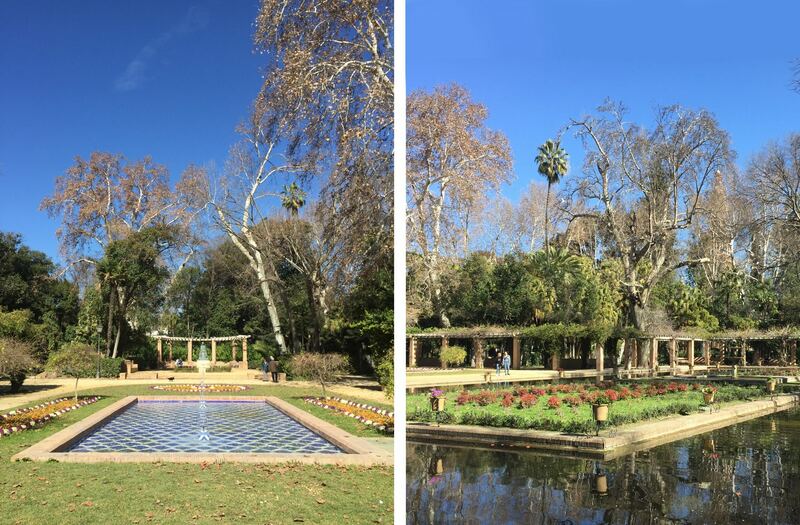 Beautiful ponds in Parque de Maria Luisa. This is now my favourite place in Spain. 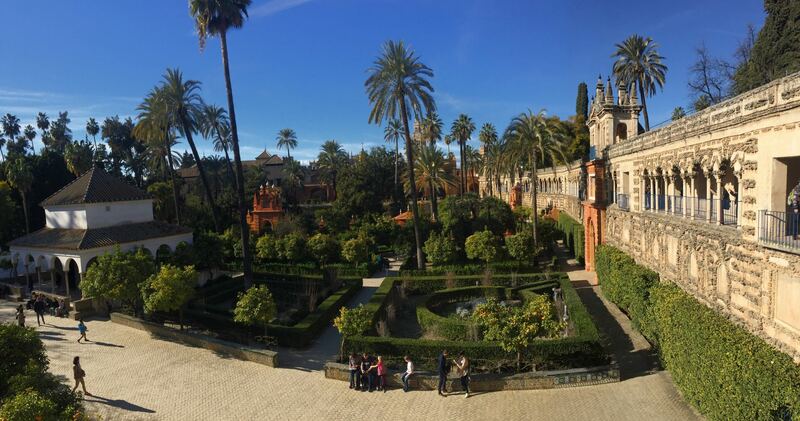 Originally built by Moorish Muslim kings, Seville’s Unesco-listed palace is a breathtaking mixture of Christian and Mudéjar architecture, with intricately carved stone hallways, and beautifully peaceful patios. Not to mention that all the Game of Thrones scenes filmed here basically makes it a real life Dorne! 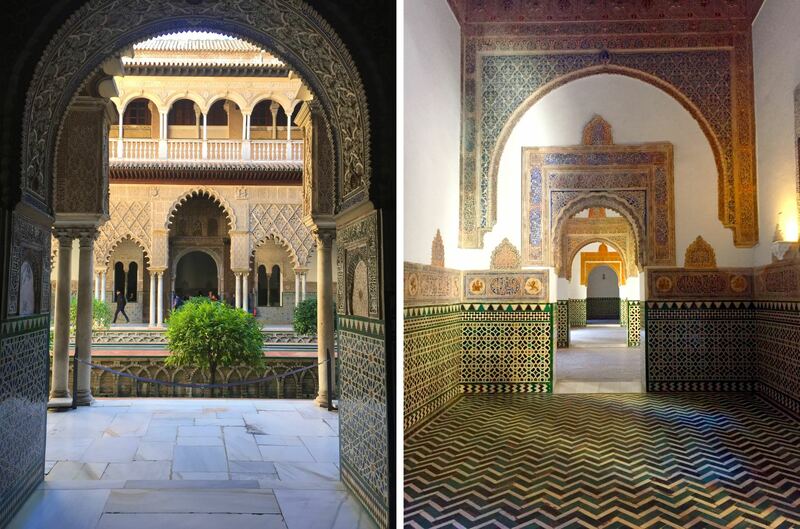 Stunning tiled rooms and courtyards in the Real Alcázar. We spent the whole afternoon walking around the different rooms, reading about their history, and taking photos of the stunning arches. Then we had a coffee, and walked around the grotto-inspired walls that frame the palace gardens. Heaven. An adult ticket is €11.50, or €3 if you’re under 25, but do yourself a favour and book in advance online, and you’ll be able to enjoy walking straight past the massive queue to get in. The grotto-style walls around the Real Alcázar gardens. This military watchtower looks out over the Canal de Alfonso XIII, with gorgeous views over the city. If you’re a history buff the rooms inside have some great displays describing why the tower was originally built, and how it’s been kept standing over the years. Top tip: Go on Monday for free entry! The Torre del Oro and its view over the Canal de Alfonso XIII. The Cathedral of Saint Mary of the See is the third largest church in the world and the largest cathedral, complete with it’s own orangerie. 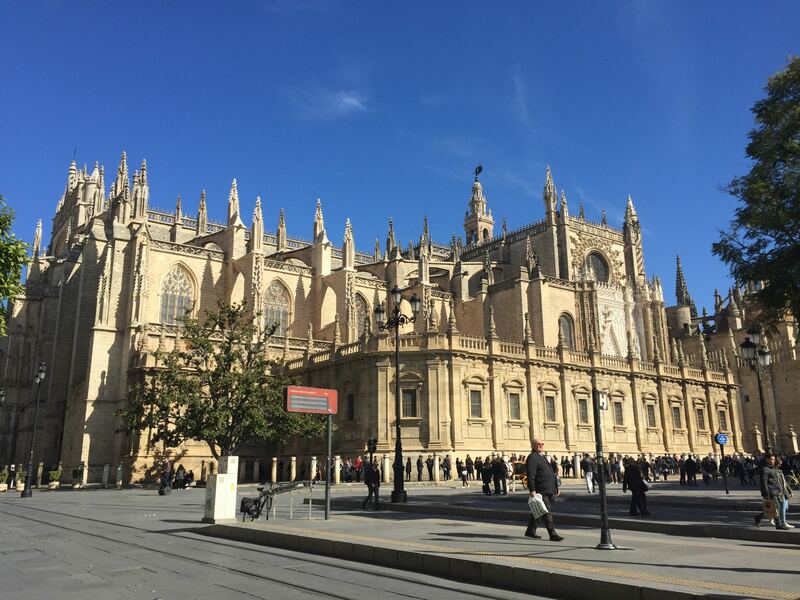 Originally a mosque, it was converted into a cathedral after Seville’s conquest by Ferdinand III, and then expanded still in the Gothic style in the 15th century. The result is a beautiful marriage of different architectural styles, much like the Real Alcázar. The inside is so big I couldn’t help but whisper “the mines of Moria!”, especially with the swooping columns branching up to the towering ceiling. Make sure you get a proper eyeful of the altar, the enormous organs, and the slightly over the top resting place of Christopher Columbus. 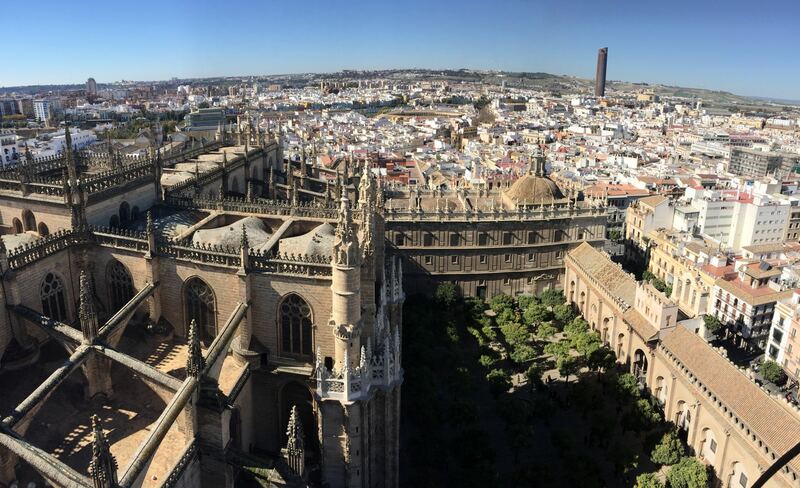 The Giralda bell tower cannot be missed, not just for the best views you’ll get all holiday, but because the spiralling ramp up the inside is so unique! An adult ticket is €9, or €4 for under 25s. The Orangerie from the Giralda bell tower. 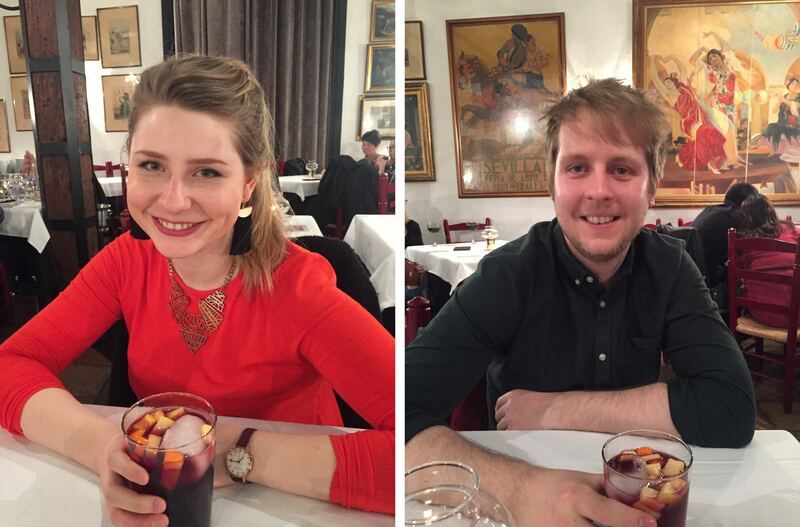 For our last night in Seville we booked tickets to see a Flamenco show at Tablao Flamenco El Arenal, which turned out to be one of the best decisions of the weekend! The show was truly spectacular, with 5 different dancers demonstrating their skills supported by two guitarists and two singers. The energy and emotion of the dance made the hour and a half performance fly by, and the free sangria didn’t hurt either! Enjoying sangria at the Tablao Flamenco El Arenal. Tickets for the show are £33 each from Tripadvisor – don’t bother upgrading to food, there are plenty of first class restaurants in the area, and you don’t want waiters interrupting the show to serve you food you can’t even see! 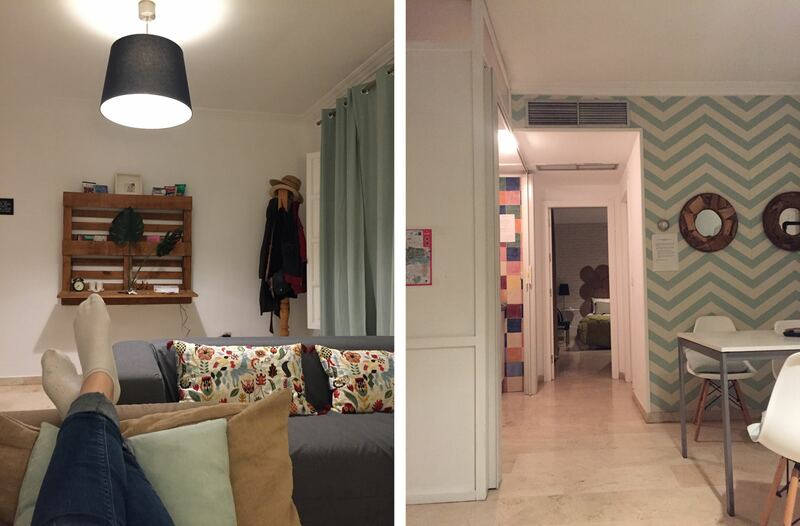 Our airbnb was just north west of the centre of Seville, on a quiet street round the corner from La Chalá, only a 15 minute walk from the Cathedral and half an hour from the Plaza de España. Our host Natalia provided us with a very thorough list of recommendations for where to eat, including our firm favourite restaurant La Brunilda. The bus from the airport into the city centre takes up to half an hour (if you’re going all the way to the end like we did) and only costs €4. Don’t worry if there’s a long queue, they will find a way to get everyone in. Whether that’s a good thing or not is your call. Once you’re in town you can walk everywhere! Just watch out for motorbikes and cars trying to squeeze their way down the tiny cobbled streets. 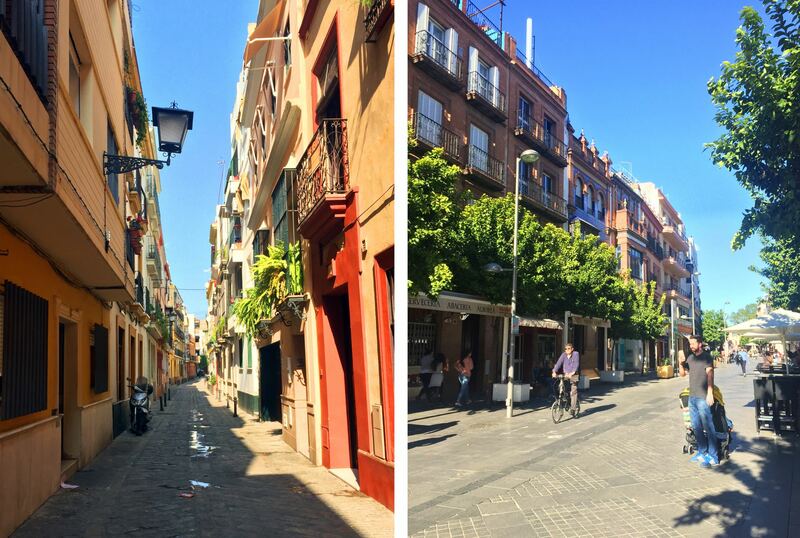 Motorbikes and bicycles are on every street in Seville. While you’re walking around the beautiful city try to stay out of the way of cyclists – the cycle lanes are easy to spot, they are lined with raised metal disks and are often painted green. If you want to get an all-in-one view of the city, you can rent a tandem bike together, join a segway tour, or catch a ride in a horse & carriage. Unfortunately I’m outrageously allergic to horses so I can’t vouch for this first hand, but all the families and couples we saw seemed to be having a great time. We were extremely lucky with the weather on our trip, with 15 degrees in the morning and 20 degrees in midday. The shade was still a bit chilly so I found the perfect clothes to be a light jacket over a t-shirt with jeans and trainers (you need to be comfy, we were walking about 20,000 steps a day). In the evenings it was much colder, think England in the autumn, so a coat over a dress was ideal. Matt wore a light jacket and t-shirt in the day, and a long sleeved shirt and jacket in the evenings. Apparently February is the rainiest month of the year in Seville (although we didn’t get any), so make sure you take a waterproof and an umbrella! The view of the Cathedral from the Torre del Oro. 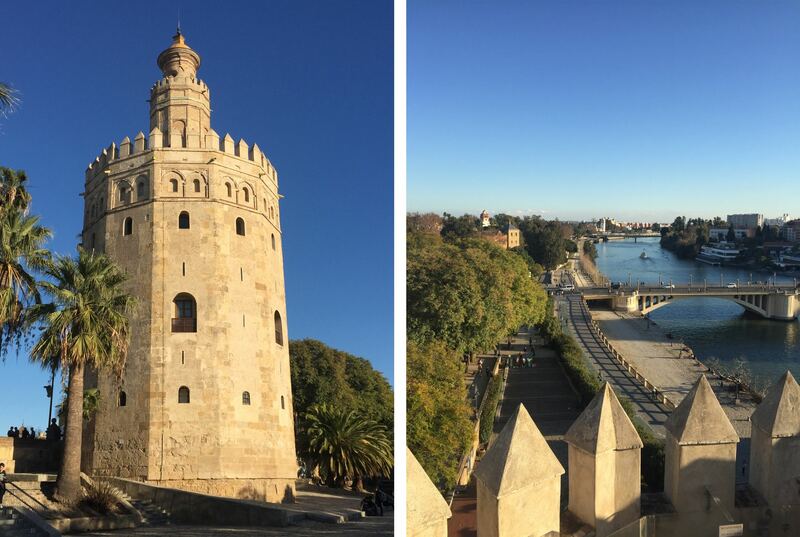 Seville is a perfect winter sun getaway, and the bonus of off-season is that the queues aren’t as long, the flights are cheaper and you can fit more into the day when the sun’s not driving you inside! 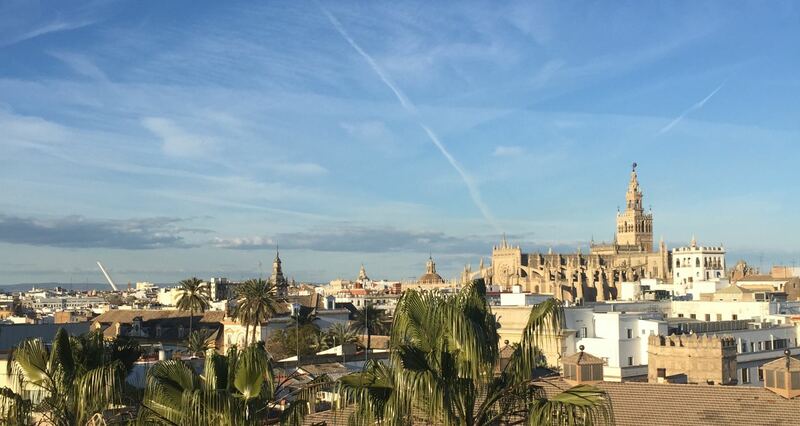 Check out more of our photos from Seville!